CEDAR RAPIDS, Iowa – The 87th version of the MLB All-Star Game on Tuesday, July 12 in San Diego will feature a large number of Perfect Game alumni, something that is becoming more and more prominent each season. Thirty-two former Perfect Game standouts will take the field for the Midsummer Classic, 15 for the American League and 17 on the National League side. The earliest PG alums (Stephen Vogt, Steven Wright, Daniel Murphy, Mark Melancon) first participated in a PG event back in 2002, and the youngest (Mookie Betts, Francisco Lindor, Addison Russell, Corey Seager) played as recently as 2011. A record 11 All-Star starters are PG alumni. On the AL side they include Kansas City Royals first baseman Eric Hosmer, Baltimore Orioles shortstop/third baseman Manny Machado, Los Angeles Angels center fielder and back-to-back All-Star Game MVP Mike Trout, and Boston Red Sox outfielders Jackie Bradley, Jr. and Mookie Betts. The six PG starters for the NL are San Francisco Giants catcher Buster Posey, Washington Nationals right fielder Bryce Harper, and four Chicago Cubs — first basemen Anthony Rizzo, shortstop Addison Russell, third baseman Kris Bryant and center fielder Dexter Fowler. Many of the 32 alumni found themselves on the same field together years ago at prominent PG events, being showcased as the best of the best, just like they will be on July 12. Russell and Los Angeles Dodgers shortstop Corey Seager both took the field together in the 2011 All-American Classic, and saw each other at the 2011 National Showcase as well. Perhaps the best accumulation of talent was in 2009 when Machado and Bryant both laced them up at the National Showcase, and Bryant and Harper played in the All-American Classic. In total, there were 11 former participants in the PG All-American Classic selected on All-Star rosters. In the AL, they are Hosmer, Lindor and New York Yankees reliever Dellin Betances. There are an astounding eight in the NL, including Posey, Russell, Bryant, Harper, Fowler, Seager, San Francisco Giants pitcher Madison Bumgarner and Miami Marlins pitcher Jose Fernandez. 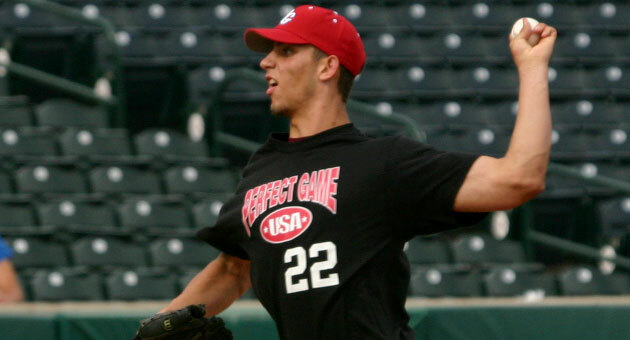 There are 16 players that put their talent on display at different PG National Showcases, and there was at least one now-major league All-Star at each PG National from 2004-11 and 2002. Hosmer (2007), Machado (2009), Lindor (2010), Wright (2002), New York Yankees reliever Andrew Miller (2002), and Betances (2005) on the AL side, and Posey (2004), Rizzo (2006), Russell (2011), Bryant (2009), San Diego Padres first baseman Wil Myers (2008), Colorado Rockies third baseman Nolan Arenado (2008), Bumgarner (2006), Melancon (2002), and Fernandez (2010). The 2016 All-Star Futures Game will be held on July 10 in San Diego with a rather large Perfect Game influence as well. Carson Fulmer, a 2011 PG All-American Classic and National Showcase participant, will pitch for the US team. Fulmer, who was drafted eighth overall to the Chicago White Sox in 2015, was named Perfect Game’s College Pitcher of the Year last season. The US roster includes five other former PG All-Americans: Houston Astros shortstop prospect Alex Bregman (2011), Texas Rangers second base prospect Travis Demeritte (2012), New York Mets first base prospect Dominic Smith (2012), Colorado Rockies outfield prospect David Dahl (2011), and Cleveland Indians outfield prospect Clint Frazier (2012). The World roster boasts one former PG All-American, Miami Marlins first base prospect Josh Naylor. Across both rosters there are 11 players that exhibited their skills at a PG National Showcase. All six of the US All-Americans performed, along with Tampa Bay Rays pitching prospect Ryne Stanek (2009), St. Louis Cardinals catching prospect Carson Kelly (2011), and Detroit Tigers outfield prospect Christin Stewart (2011). The list that follows is the list of prospects that will be playing in the Futures Game that are also Perfect Game alumni, as well as their current minor league assignment.